Unfussy, wholesome food, and plenty of it! 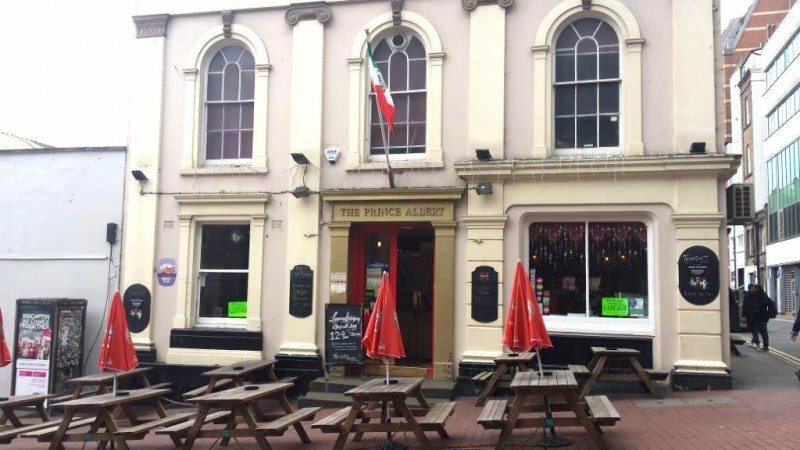 The Prince Albert is about as slap-bang in the middle of town as you can get, being no more than a hundred metres from Brighton Station. It has been there forever and the last time I went there was when I was a student and I bumped into Captain Sensible (which dates both me and the pub). There is outside seating in a yard out the back or on the pavement in front of the pub. It’s not the prettiest part of the city but it is great spot for absorbing the bustling Brighton vibe and you can indulge in a little people-watching too, which in Brighton is never boring. 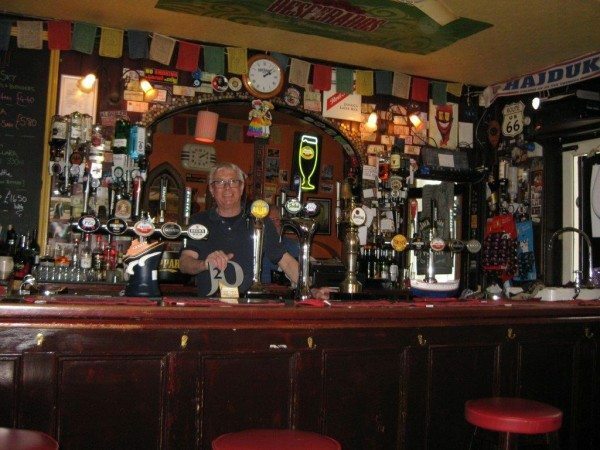 Considered by some to be a Brighton institution The Prince Albert is a must if you are into music. They have live gigs every night of the week and cater for all tastes, featuring everything from “metal to funk and acoustic”. 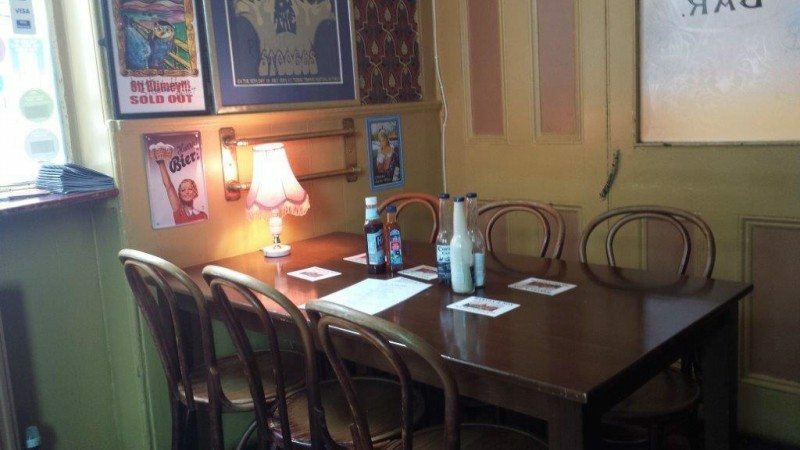 The furniture is a little rickety and the décor is a whacky mix of old-fashioned tassled lampshades, flags on the ceiling and music posters everywhere, oh and the odd spot of fantastically random floral wallpaper! The staff are friendly and attentive and the service is good. If you are into your craft beers there is a good selection available on tap, including Aurora, a refreshing, zesty little number and one of several ales on offer from the East Sussex based Burning Sky brewery. Lynsey has been running the kitchen at The Prince Albert for 4 years and last year she took on the kitchen at The Battle of Trafalgar as well (see Lydia Majic’s review). Lynsey prides herself on using local, seasonal ingredients whenever possible and the menu even tells you where the meat is sourced. 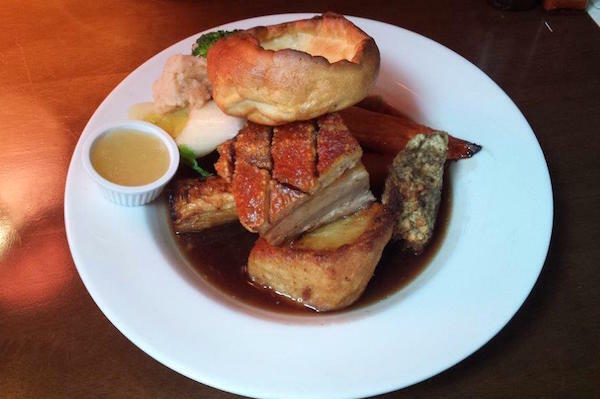 Food is cooked fresh to order and a Sunday roast will set you back just £10.95 and a pudding, if you have room for one, is £5. I chose the home-made nut, cheddar and sun-dried tomato loaf and my husband went for the slow-roasted pork belly and crackling. 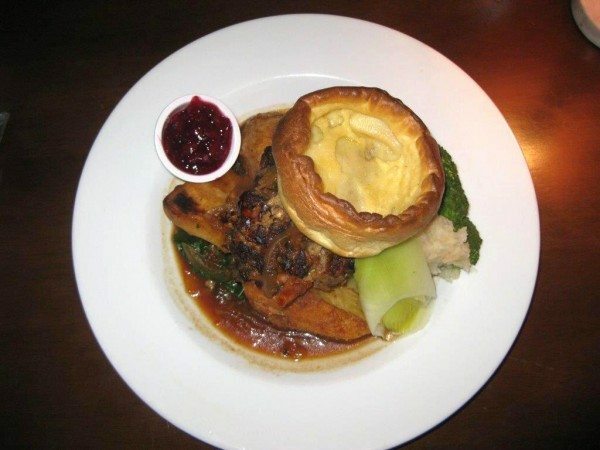 You could also have chosen peppered topside of beef, lemon and thyme chicken with stuffing or garlic and rosemary lamb. As the food is cooked to order you expect to have to wait a bit but our meals arrived within a very respectable 20 minutes. When the food came it was hot, looked good and smelled fantastic! My nut loaf was crunchy on the outside and moist and cheesy in the middle, very moreish. 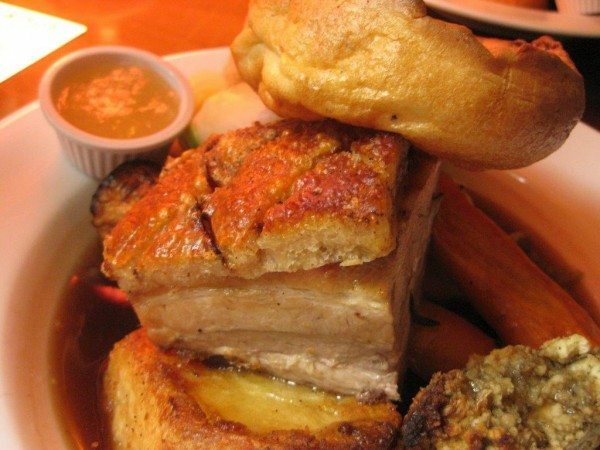 The pork belly was succulent and tender and the crunchy, salty crackling was spot on! What the pictures fail to accurately convey is just how much food you get for your money. It was a truly gargantuan stack of grub. Along with the main component of the dish we counted eight different veggies! All of which were fresh, well cooked and full of flavour. We also got a healthy-sized, crispy, golden Yorkshire pudding each, a pot of apple sauce and some stuffing to go with the pork and cranberry sauce for the nut loaf. All generously coated in rich glossy gravy. My husband managed to polish his plate but I must confess I was defeated and had to leave a few of the veggies or risk rupturing something. In fact if I had one minor criticism it would be that I would have liked a little less of the veg, lovely as they were, and perhaps a slightly larger portion of the delicious nut loaf/pork belly. After a brief pause to prevent injury, we decided to try a pud. As Lynsey pointed out “it would be rude not to”. 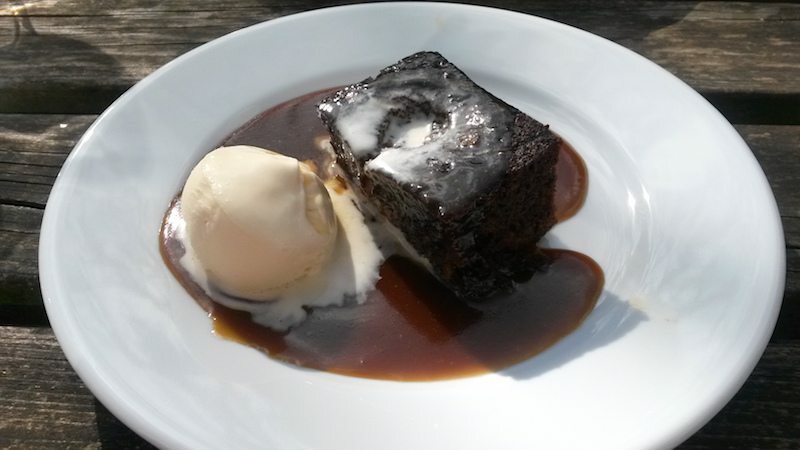 We thought it best to share something and went for the sticky toffee pudding with vanilla ice-cream. We could also have had a gluten-free chocolate torte. The sticky toffee pudding was rich and sweet and sticky and indulgent, basically everything you want from a sticky toffee pudding and the perfect end to a great meal. All in all, exceptionally good value given the sheer quantity of lovely grub you get. 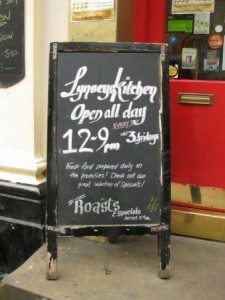 Lynsey’s kitchen is open every day from 12pm – 9pm apart from Fridays when it closes at 3pm.